The DS 7 Crossback is a key part of the PSA Group subsidiary's plan to end its steep sales decline. PARIS -- DS Automobiles CEO Yves Bonnefont knows that it's impossible to create a premium division overnight. He knows, however, that the PSA Group subsidiary needed to shake up its European dealer network to end a prolonged sales slump and capitalize on a long-awaited product offensive. 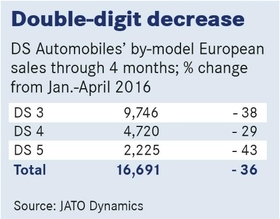 "We have a network that is largely oversized for us," Bonnefont told Automotive News Europe. "I sold 65,000 cars in Europe, so I don't need a network designed for 1 million sales." Currently, most DS models are sold within Citroen's showrooms because it was originally conceived as a subbrand of the long-established and much bigger French marque. The retail relationship has been less than perfect since DS became a stand-alone brand in 2014 because the sales force has been mostly trained to sell Citroens. "They are not very familiar with the DS product and the DS customers," Bonnefont said. To remedy that, he is slashing the number of DS outlets and creating separate showrooms for the brand. He hopes to have 400 DS outlets in place by the end of this year. He has also created a monthly "DS boot camp" for dealers that started this spring. Over three days, salespeople learn about DS' strategy and forthcoming lineup. The first model designed from the ground up for the brand, the DS 7 Crossback SUV, will be in showrooms at the end of this year. 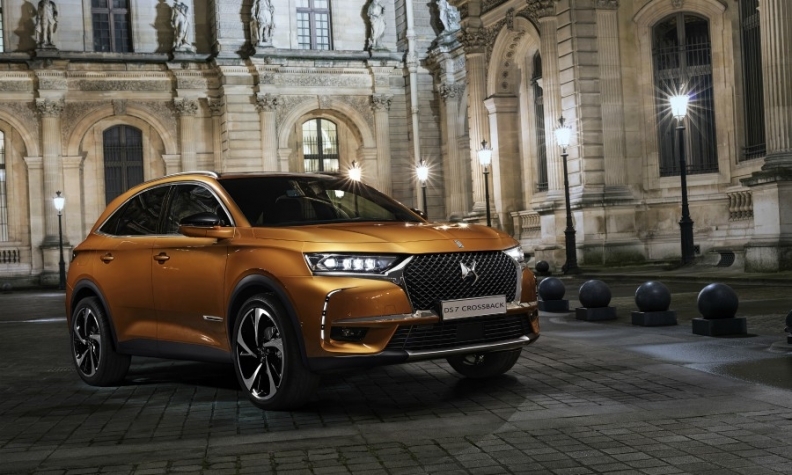 Though it is similar in dimensions to its PSA sister models, the Peugeot 3008 and Citroen C5 Aircross, Bonnefont says the DS 7 Crossback communicates the brand's DNA through a focus on refinement, technology and high-quality materials. "What I want is that anything you touch in the car has to have some craftsmanship," he said. "It gives a sense of a car being made by people for people." To help promote that message, the DS salespeople who are taking part in the boot camps, which are held in Paris, visit the workshop of the luxury jeweler Van Cleef & Arpels for briefings on how to create relationships with high-end buyers. DS's current European range includes the DS 3, introduced as a Citroen model in 2010; and the DS 4 and DS 5 crossovers. Sales of all three are on the decline. The brand's lineup in China, where models are built in a joint venture with Changan Automobile, also includes the five-door DS 4S, the DS 5LS sedan and the DS 6 crossover. In the midterm, DS will introduce one new model a year for six years, reportedly including a flagship sedan that would recall the original Citroen DS of 1955. Bonnefont declined to offer any specifics, but he said that as a new player, "We decided to put our six models in segments where we see global growth to be the fastest," which he acknowledged are SUVs and crossovers such as the DS 7 Crossback.